NOT SO UNIQUE. At least once a week (and sometimes as often as two or three times a day), our Sun has a coronal mass ejection (CME), an event during which it spews plasma and charged particles from the outermost part of its atmosphere called the corona. This usually happens following a solar flare, a sudden increase in the Sun’s brightness. We’ve known about our Sun’s CMEs since 1971, but we’d never observed them from another star — until now. AN UNEXPECTED DISCOVERY. The team noted HR 9024’s CME while sifting through decade-old data from NASA’s Chandra X-ray Observatory. They were looking at changes in the wavelengths of X-rays from the star in the hopes of improving their understanding of its corona. While looking at this data, they noticed approximately 1 billion trillion grams of material — what you’d expect from a CME — moving away from HR 9024 following a solar flare. But, strangely enough, the material then moved back toward the star. 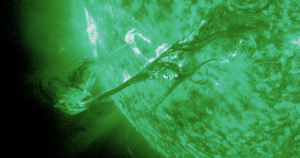 This doesn’t happen after CMEs from our Sun, but it does fit in with the prediction of previous research that a CME might not be able to fully escape the magnetic field of a larger star. It could also explain why we hadn’t noticed CMEs from other stars before — the plasma and particles never really left their home stars. THE SEARCH FOR LIFE. When CMEs reach the Earth’s atmosphere, they can disrupt our satellites, bathe airplanes in radiation, and even cause electrical blackouts. They can’t hurt humans on the Earth’s surface, though — the planet’s atmosphere and magnetosphere protect us. Now that we know for sure that other stars can have CMEs, we might be able to use that information to inform our hunt for habitable planets. But we have to understand what effect they have first. If CMEs aren’t likely to reach a planet that orbits a massive star, life might be more likely to survive on that planet’s surface. But the continual looping of CME energy could also result in more solar flares, which can also impact a planet’s habitability. In any case, this research tells us more about stars than we knew before. And now, other researchers will have a better idea of what to look for as they search for CMEs elsewhere in the universe. The post Scientists Observe a Star That Spews Plasma — And It’s Not Our Sun appeared first on Futurism.